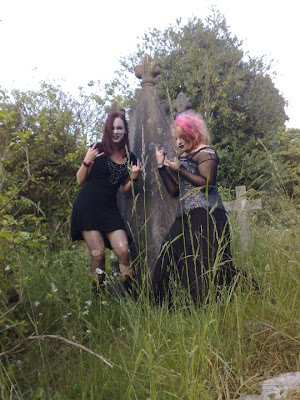 Elzabi writes "This photo may not look particularly sweaty, but a friend accidentally planned a goth-graveyard-picnic on the hottest day of last summer. I learned a valuable lesson that day which I would like to share with your readers: don't wear a corset in hot weather, breathing is necessary even if you think you're undead." Ah, the joys of picnics with dead people. In multiple layers. In summer. As for corsets in hot weather? I admit, I left my corsets at home on Bats' Day this last year. I looked atrocious and blobby but I had fun and barely overheated at all. But NEVER AGAIN, I say. been goth, corseted and in the tropics for 20 years. never had a problem. I've never had a problem either. I suspect it might be harder for some people who tight laces infrequently because they'd be less used to it.